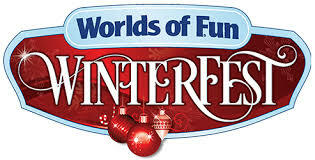 In this update we will take a look at the attractions that Worlds of Fun is offering during Winterfest. First up is St. Nick's Pics where you can meet the jolly man and have your photo taken with him. Reindeer Round-Up features a moose who wants to join Santa's team. Sounds of the Nativity features a petting zoo of nativity animals. Prowler is one of two coasters open during Winterfest. Ice skating has moved to the Rip Cord Lake which is now known as Snow Flake Lake. They have a much better set up this year and it was busy all evening. Here's a look at the new Snow Flake Lake. I thought it turned out very nice. Though I think they'll need to seriously think about expanding it to the other side of the RipCord platform next year as I think the demand is there for a larger rink. New this year in Planet Snoopy is Charlie Brown's Tree Farm. This cute walk through attraction reuses the lanterns from Haunt as well as Linus' Pumpkin Patch trail area. Heading into the lower portion. Look at all of the trees. The famous Charlie Brown tree is there as well. Another new addition this year is carriage rides which cost $6 per rider. Also new is Jack Frost's Igloo Village. This sort of "cabana" village is an additional upcharge. For a flat rate, up to 4 people can enjoy this heated igloo which comes with many perks including reserved seating at the 2 major shows, unlimited cocoa, ice skating session and more. In Europa, the troll has been repurposed as a large elf. Artisan Alley has been split up and placed along the main midways around the park, including Europa. Some more in the Orient. Mrs. Claus' Kitchen was moved to a new larger location this year. Here you can decorate 4 large sugar cookies for $15 while interacting with Mrs. Claus and several elves. Also new this year is the Lucky Cat which is serving bubble tea. Festive Feast is back in the Battlecreek restaurant. This is a one time through buffet. You can see the pricing and offerings on the banner here. The snow globe is back again this year. It is located near the 3pt Challenge in Africa. There are plenty of roaming characters this year including Scrooge and the ghosts. Here are a couple more characters entertaining the crowd before the official tree lighting.